“P-e-r-f-e-c-t! Tracking your expenses is the one skill that all the financial gurus agree will have the biggest impact on your bottom line. People THINK they know where they spend their money, but one or two days of beginning tracking is an eye-opening (and empowering) experience. 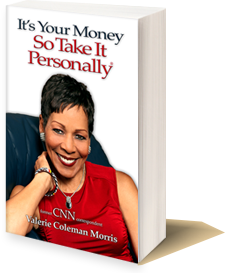 Thanks Valerie.” — Jude G.
“Thank you for sharing and doing what you can to spread knowledge, and awaken people concerning their financial well-being.” — Milo E.
“Val your report this morning on CNN is the kind of clear, concise informational financial message Americans need to hear. 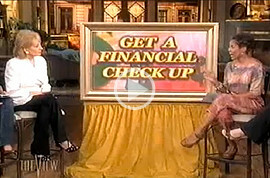 Thank you for the insight into the fact that Black couple rarely discuss serious financial plans.” — Stan B. “You go girl, thanks for reaching out to help people with their $$$$$$$$$$$$$$$$$$.” — Sharon S.
“Thank you so much for your quick reply, I look forward to using your information to getting out of debt and saving for my future!” — Cynthia E.
“I saw your report on CNN at work today and I viewed your website. I also made your website my homepage so that I continue to be inspired. I am a single mom of a 19yr old daughter in her 2nd yr of college.” — Dottie T.
“I can’t begin to thank you enough for taking the time to give me such detailed advice that is pertinent to my specific situation. I know that you’re very busy, and it is truly an honor to receive your pearls of wisdom.” — Sascha B. “I checked out your website and think your money valuable tips are a great idea for young women. I currently have two daughters in college and two more behind them, and if you are going to offer those Financial Literacy 911 seminars again, I would love to attend and bring my daughters with me.” — Carla D.
“I feel like I have a personal cheerleader!” — Julie S.
“I love your message. It is simple but pertinent. In these times, simple ideas are the best. Back to basics. With an aging father after having lost my mother earlier this year, there are plenty of issues to be resolved on a routine basis. Thank you for your message, may I say your ministry, to help people in these unusual times.” — Lil M.
“It was such a joy to meet you at the conference. I think I was supposed to be there specifically to meet you. Thank you so much for your inspiration.” — Linda S.
“Great advice as usual!” — Barbara C.
“You are so full of GOOD ADVICE!! !” — Wendy P.
“See you on the ‘Radio’ I’ve always admired your work Valerie!” — Stone L.
“Loved your article Valerie.” — Jude G.